The SOLAR-JET project (Solar chemical reactor demonstration and Optimization for Long-term Availability of Renewable JET fuel. 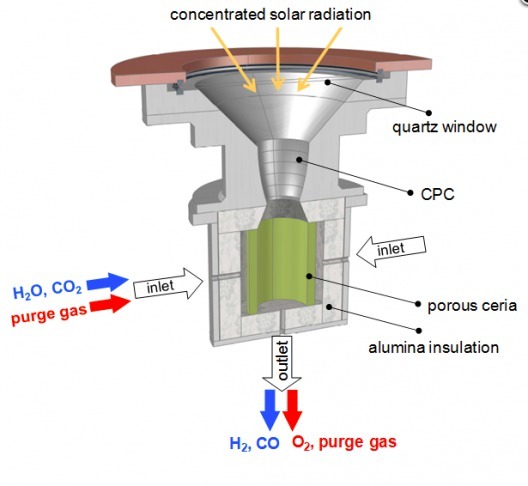 or SOLAR-JET) pulls carbon dioxide from the air, mixes it with water and exposes the mix to 1,500 degree (Centigrade) concentrated solar energy and makes a synthetic natural gas, with oxygen as the only exhaust. Attempting to produce a useable fuel from CO2 has been an obsession for many over several decades. Attempts to capture and store CO2 are expensive and usually only hide the carbon, ostensibly for eternity. SOLAR-JET explains its objectives on its web site. “The aim of the SOLAR-JET project is to demonstrate a carbon-neutral path for producing aviation fuel, compatible with current infrastructure, in an economically viable way. Because the process hopes to pull CO2 from the atmosphere, the CO2 produced by its eventual combustion would be neutral – equal to the CO2 removed from the air to produce the fuel. So far, only 700 liters of the syngas has been shipped from Zurich to Shell Global Solutions in the Netherlands, where application of the Fischer-Tropsch process turns the material into kerosene. Furler has an optimistic view of where this could go. “Our long-term vision, and what we are following, is that we will be extracting the CO2 from the atmosphere. This way, we are able to close the carbon cycle and produce CO2-neutral fuels. The technology is expensive, but commercially available.” His researchers hope to triple the efficiency of the process to help bring costs down. 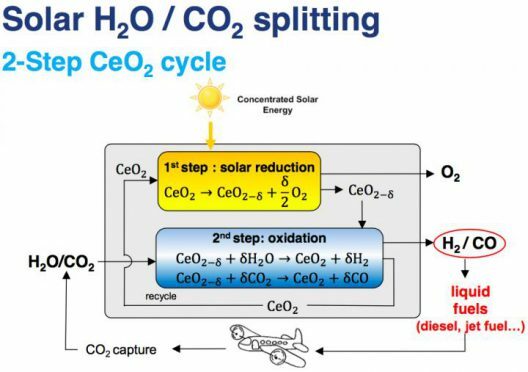 Because the concentration of sunlight takes the reflected energy of 3,000 times the power of the sun to reach the 1,500 degrees C required to turn the CO2, water and air into a usable fuel precursor, costs may not be competitive for a while. The Sahara, where St. Exupery survived a forced landing and became inspired by the vast quiet to eventually write Wind, Sand and Stars and The Little Prince, could serve as a source for the sunlight needed to make the jet fuel for future flight. 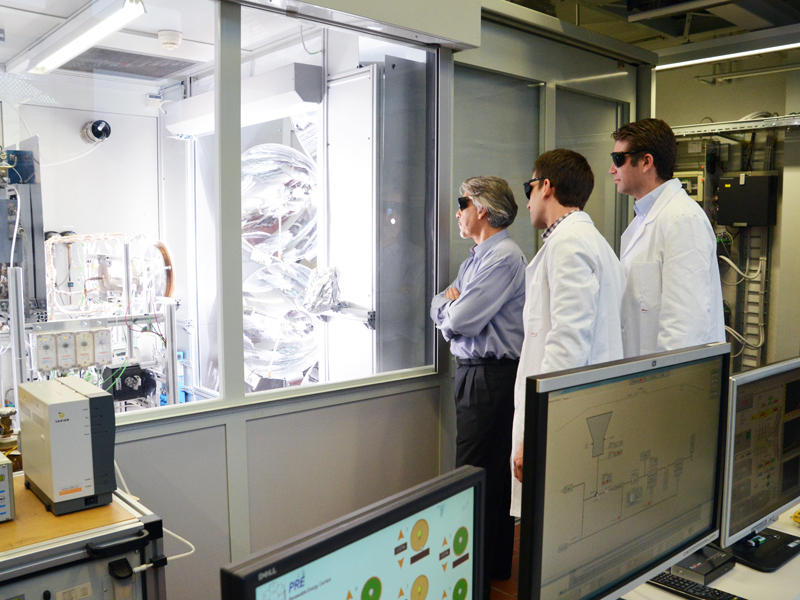 Aldo Steinfeld, one of the ETH researchers says, “The long term goal is to reach a 15 percent efficiency with the solar-driven cyclic process. 20,000 liters [of] kerosene per day could then be produced in a solar tower system of one square kilometer. The Sahara encompasses 8,600,000 square kilometers (3,320,000 square miles). The results of the ETH team’s research is published in the November 18 edition of the Royal Society of Chemistry’s journal, Energy and Environmental Science. Team members include Philipp Furler, Jonathan R. Scheffe, and Aldo Steinfeld.